A very special event to raise money for a very special little girl will take place in Newcastle upon Tyne in the UK in September. In January 2007, 18 month old Tilly Lockey contracted a rare deadly strain of Meningococcal Septicaemia nearly costing her her life. Tilly was saved but unfortunately lost the tips of her toes and both hands. Since then the family have been trying to give their daughter a normal life and making her life as comfortable as possible. When looking into what prosthetic options were available for children in the UK there wasn’t a great deal available unless it was privately funded but this came at a cost of around £23,000 per set. As Tilly was a normal growing child, these would have to be replaced 2 to 3 times annually. Through the frustrations of the family the novel idea of approaching celebrities to take their hand casts to place in frames came about, after collecting literally hundreds of celebrity handcasts the Give Tilly A Hand Appeal was born. These handcasts were sold at auction at the first Celebrity Ball, last September, raising in excess of £40,000. 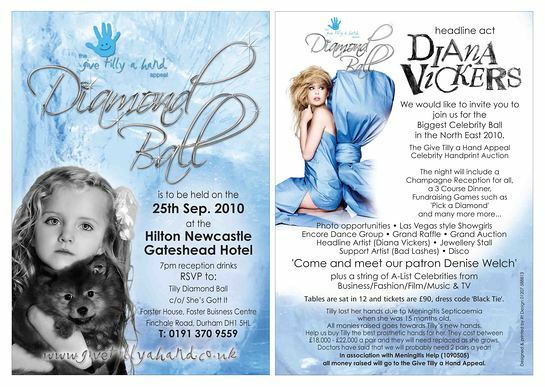 This year the family are holding the ‘Diamond Ball’ and selling a mixture of celebrity handcasts and bespoke jewellery that has been made for Tilly. The event will take place on September 25, at the Hilton Hotel Gateshead, Bottlebank, Newcastle upon Tyne. The show will feature Diana Vickers and X Factor 2008 finalists Badlashes, with appearances by Denise Welch, Duncan Bannatyne, Big Brother’s Anthony Hutton, Rob Lee and many more.